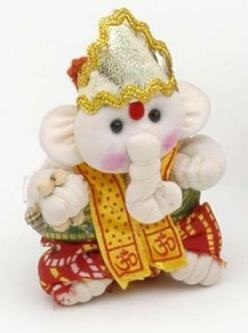 Sorry, we are currently sold out of 'Parvati With Baby Ganesh Statue from India'. Please click the Wait List link below and you will be notified when it is back in stock. 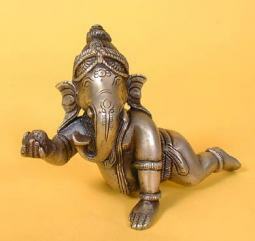 This is a brass statue from India of Sri Parvati and Sri Ganesh as a baby. This statue is 7 Inches Tall, by 5 Inches Wide, by 3 Inches Deep, and these statues are %prodprice% Each. Parvati is one of the major aspects of Devi, the universal goddess in hinduism. She is known as one of the benevolent forms (while Durga and Kali are the wrathful forms). She is appears as Shiva's consort, considered in this form to be a mountain goddess. According to legend, Shiva had become despondent over the death of his wife, so he turned to the life of a hermit. He sat concentrating his energies until he turned into a pillar of fire. The gods became worried over this, and begged the mother goddess Shakti for help. In response, the goddess took the form of Parvati, princess of the mountains, and sought to win Shiva's heart. Parvati then took on the life of a hermit as well, and mortified her body through austerities that won Shiva's admiration, and he accepted her as his consort. Inspired by Parvati's beauty, Shiva made music and began to dance. Parvati also was able to get Shiva to reveal the secrets of the cosmos locked in his mind. It is believed many seers were enlightened when they overheard their conversation between the two lovers. Parvati is highly revered for her ability to transform the austere ascetic Shiva into an amorous householder. 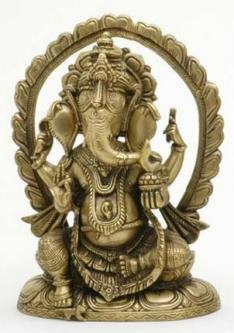 Ganesha is the God of success and overcoming obstacles, but is also associated with wisdom, learning, prudence, and power. As the god of success, his names are chanted at the start of any important venture. 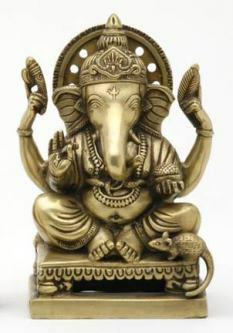 As the remover of obstacles, he is invoked at the start of every journey, marriage, religious rite, house construction, the writing of a book or even a letter. There is a famous legend about his birth and how he came to posses the head of an elephant. this legend relates that his mother, Parvati, had to go for her bath when her husband, Shiva, was not at home. As Shiva had gone on a meditation retreat and was not expected to return, Parvati ordered Ganesha to keep guard and not let anyone inside the room. But after a while Shiva arrived and when he tried to enter, the child refused to let him do so. This angered Shiva, who cut off the child's head.